Today we are sharing a lovely heart craft that can be enjoyed during a preschool shape theme or in preparation for Valentine's Day. My preschooler and I made yarn hearts and then turned our creations into a craft inspired by the book, The Day It Rained Hearts. 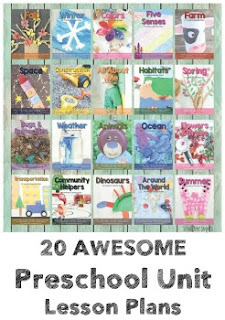 This craft idea can be enjoyed by kids of all ages and adults. In fact, it would make a lovely collaborative Valentine art project! We have always had a great time putting our yarn wrapped crafts together like our Yarn Wrapped Rainbow and Yarn Wrapped Tulips. Yarn wrapping is wonderful for fine motor skills, concentration, and is easy to do! Inspired by the book, The Day It Rained Hearts we turned our yarn hearts into a beautiful heart mobile. Begin prepping the activity by cutting hearts and a large cloud from poster board. Gather red, purple, and pink yarn, cotton balls, and glue. I had Little Sis work on gluing cotton balls to the poster board cloud. 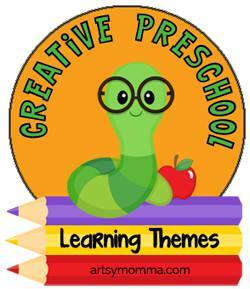 Your child can glue the cotton balls onto the cloud shape as-is, or pull them apart to make whispy clouds. 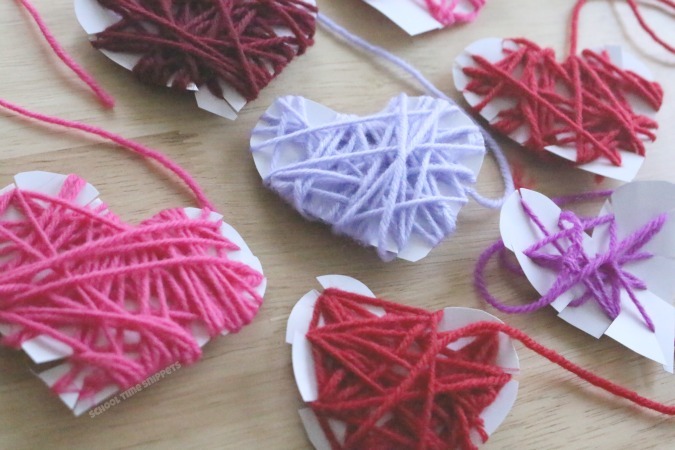 Next, have your child choose a color of yarn and wrap the yarn around one of the hearts. I added snips around the heart to help keep the yarn in place. I bought a large box of yarn that had plenty of different shades of pink, purple, and red, so we made several yarn wrapped hearts. 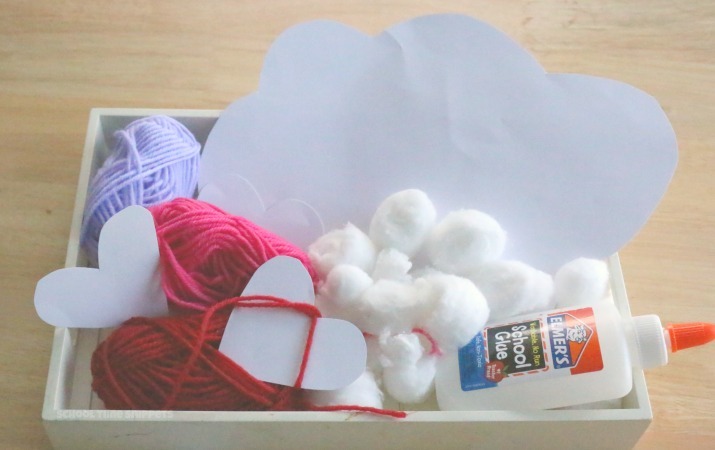 Once several yarn wrapped hearts have been made, leave a long "tail" of yarn to be taped to the back of the cotton ball cloud. Cut another piece of yarn and tape both ends to the back of the cloud, also. 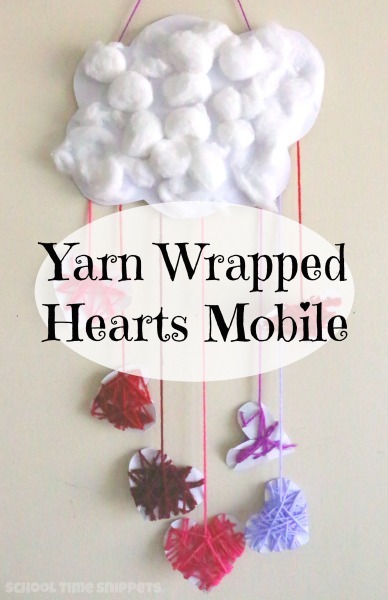 That will be how you hang the Yarn Wrapped Hearts Mobile, so it looks like it is "raining hearts!" It turned out so lovely! And was so easy to make! 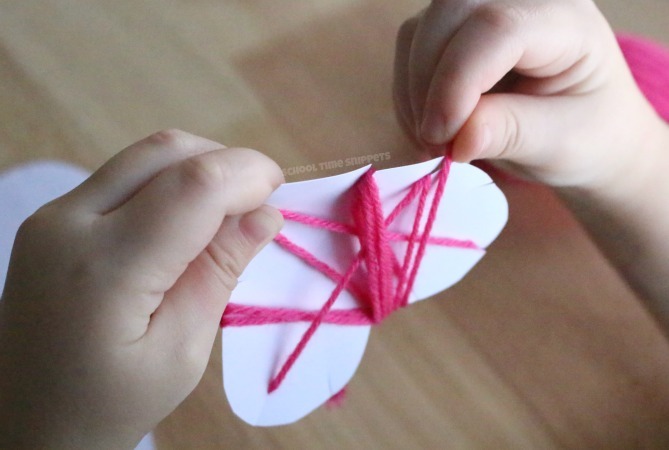 Have fun reading plenty of Valentines books to your preschooler and making our Yarn Wrapped Hearts Mobile craft!